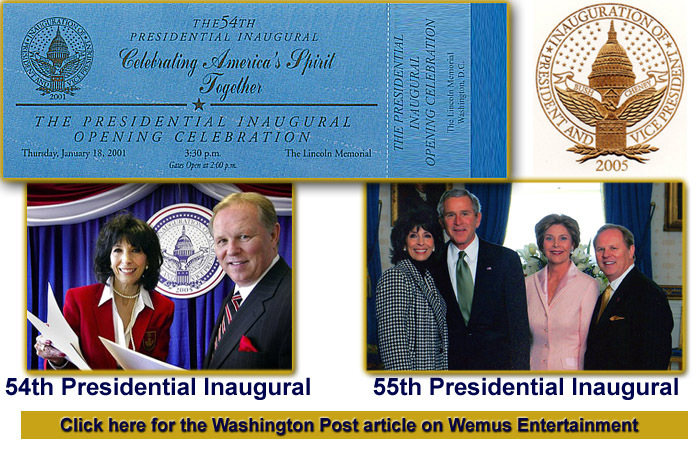 Presidential Special Tribute: "Saluting Those Who Serve" - 2005 - Washington, DC. White House: "A Celebration of Freedom" - 2005- Washington D.C.
National Federation of Republican Women (Laura Bush Tribute) Philadelphia, Pa.
Republican National Convention 2000, Philadelphia, Pa.
PBS / White House "Salute to Americana Gala" - Washington D.C.
White House Annual Easter Egg Roll - Washington D.C.
Georgia Governor's Inaugural Ball and Gala 2003 - Atlanta, Ga.
Mississippi Governor's Inaugural Ball and Gala 2008 - Jackson, MS.
Wemus Entertainment has produced many different types of events for various clients. Our clients include corporations, private schools, Junior Leagues, Symphonies, health organizations, fundraisers and country clubs.